Microscopy techniques used to study the movement of swimming microbes are limited to two dimensions (2D) or require sophisticated devices. 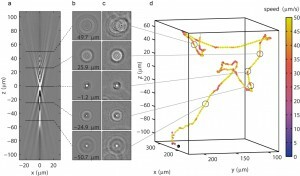 In a paper to be published online on 2 November, AMOLF researchers present a new method to track the movement of bacteria swimming in three dimensions (3D) using simple microscopes that are standard in biological laboratories. Bacteria, microscopic organisms measuring only a thousandth of a millimeter in length, are able to move rapidly in water, swimming about ten times their body length per second. These movements have far-reaching effects on human health, agriculture and industry, as well as impacting our natural environment by shaping ecosystems and global climate. Two AMOLF research groups, headed by Tom Shimizu and Sander Tans, have teamed up to develop a new method that allows the tracking of swimming bacteria at unprecedented efficiency, and – importantly for applications – at very low cost. A key innovation of the new technique is in dramatically simplifying the process of tracking bacterial movements in 3D. Most microscopes are designed to image things only in 2D, and those capable of 3D usually operate too slowly to track the fast swimming of bacteria. A number of innovative techniques have been developed in the past for bacterial 3D tracking, but the best performers have also required sophisticated equipment that is expensive and/or requires highly skilled users. By contrast, the new method requires only a standard biological microscope, a video camera, and a PC. “The secret is in the software that extracts 3D information from movies that would otherwise appear in 2D, like usual,” explains Katja Taute, a postdoctoral researcher and lead author on the study. “So in that sense, the computer program acts just like a pair of 3D glasses.” Because no special equipment is required, the researchers believe the method has the potential to make 3D tracking a routine tool for studies of bacterial mobility, paving the way to deeper and broader understanding of its role in diverse areas including medical, environmental and industrial research. Another important feature of the new technique is that it allows tracking of dozens of bacteria simultaneously. So not only does it allow 3D tracking “by the masses”, it also helps produce masses of data with ease. Importantly, this “high throughput” enables researchers to ask questions that go beyond how a ‘typical’ bacterial cell behaves. It is increasingly recognized that even ‘clonal’ cells that share exactly the same DNA can behave very differently from one another, and such diversity can have profound effects at larger scales with practical consequences (for example, how to treat bacterial infections with antibiotics). Capitalizing on the efficiency of their 3D tracking method, the AMOLF researchers demonstrated that the swimming behavior can vary substantially between sister cells with identical DNA sequences, and that this ‘individuality’ can have a significant impact on how the entire population migrates. This work was funded by the Netherlands Organization for Fundamental Research’s Foundation for Fundamental Research on Matter (NWO/FOM) and the Paul G. Allen Family Foundation. A 3D trajectory of a swimming bacterium (d) can be reconstructed by comparing images of the bacterium (c) to images from a reference library (a) that shows what a particle looks like at different positions in the third dimension (b).